I know. It’s ridiculous. I honestly didn’t think this one was going to be feasible. A few weeks ago I was offered a chance to work at an event. The only detail I knew was that President Obama would be there. I accepted, of course. I didn’t even know what this event was all about until the rehearsal. It ended up being the Gridiron Club Dinner, a 128-year-old dinner during which politicians put on satirical skits and speeches. After I was done with my part, my boss and I made our way up to the head table where President Obama was sitting. We saw others going up to him, shaking his hand, and talking to him. Why not us? We inched our way up and realized, “this could happen.” And it did. I greeted President Obama, he asked me my name and what I did. We talked about me being a teacher and he stressed how important it was. We laughed about a few other things, then we parted ways. I was so nervous afterward I tried to call Lyssa and dialed the wrong number. Twice. It will stand as one of the most memorable moments of my life. He was so personable that he felt like a member of my family. On the news front, I met Chris Matthews, Chuck Todd, and John King. They were all so open and friendly. On the political front, I met Susan Rice, the United States Ambassador to the United Nations. She said I was handsome. Score. I also met Jay Carney, Obama’s Press Secretary, who did not say I was handsome. And to top off an already great night, I talked to Baltimore Ravens Coach John Harbaugh for a few minutes. He was very excited to talk to me about football. I guess he had no one else to talk to. 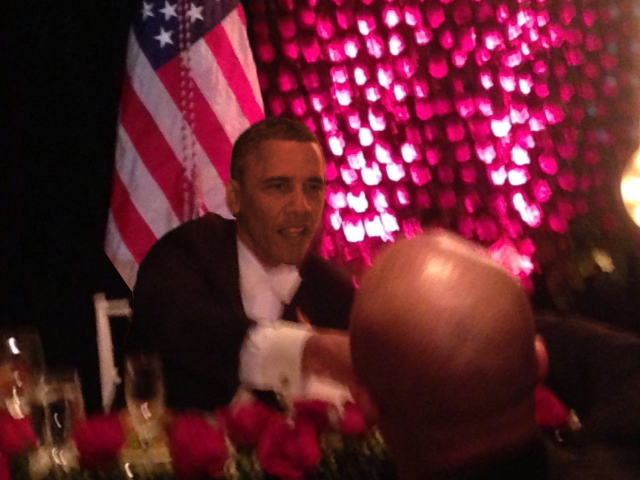 And for fun, I made Lyssa Photoshop an un-blurry picture of President Obama’s face onto my picture so I can hang it in our house. I could go all of 2013 not completing another goal and I’d be happy. In one word: amazingbeautifultearjerkershakesbestnightever.